You’ve got to admire bands that play and record music they actually like. Because they, well, like it. And not because they think it’ll sell by the crate load, not because they think it’s ‘hip’ or the next big thing. Such bands will never be wealthy, at least not in terms of dollars or pounds. But artistically they are rich beyond dreams of avarice. And I for one am glad they continue to follow their own particular muse. In my own little way, by buying music by bands like The Underground Railroad, Discipline, Iluvatar, Starcastle, Spiraling, Fluttr Effect, Little Atlas, Echolyn, and dozens of others I have been making my own little stand for, and paying my own little homage to integrity and honesty for quite a few years now. My DPRP resume made much of my penchant for American third wave progressive rock music. Well, we’re surfing the fourth wave now and that love continues unabated. Wow! At last! 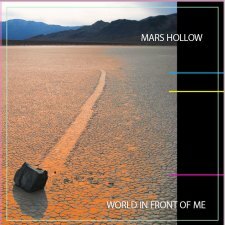 I’ve been waiting four months for a 2010 release to really grab my interest and, finally, it has arrived in the form of this absolutely splendiferous debut album from Mars Hollow! An album without fault: music that is at once complex, brilliantly played and yet melodic and catchy! Music! Hurrah! It’s definitely one worth adding to your collection if you like any of the bands I’ve mentioned, or for that matter Rush, Yes, King Crimson, Gentle Giant, Genesis, ELP or Kansas. And, let’s face it, who doesn’t? Produced and mixed by Billy Sherwood no less (Yes, Circa:, World Trade), and mastered by producer David Javu Morse (David Bowie, Alice In Chains, Frank Zappa) this new one is a must-buy. I’ve only had the mp3 to listen to, and up until recently I’ve been playing it (pretty much constantly) in the car and on the alienware laptop. However, I’ve just got a cool little sandisk cruzer usb thingie, tiny as you like, and made of plastic, for transporting tunes into the car without having to burn CDs. So, I’ve dragged and dropped The World In Front Of Me onto it. And, I’ve now got some What Hi-Fi award winning Denon kit, with usb, and some Q acoustic 2010 speakers with some seriously good cabling. This record sounds amazing – the production is a thing of beauty. Probably the best I’ve heard for a non-mainstream release. The musicianship, songs and overall vibe – of some guys about my age tearing it up and playing music they love – is wondrous to behold. There’s been a massive buzz about this record, and the band’s live performances (including a stunning set at RosFest), all over the progressive rock t’interweb for some time, and once you pop this thing into your quality listening platform of choice you’ll know why. They’ve recently been interviewed on Sea Of Tranquillity, and, signed to 10T Records, their star is most definitely in the ascendancy. John Baker’s vocals are heavily reminiscent of Glenn McLaughlin of (personal favourite) Iluvatar but elsewhere he’s been compared to a cross between Jon Anderson and Geddy Lee. Kerry Chicoine is your new favourite bass player (who has an amazing Chris Squire/Geddy Lee/Les Claypool thing going on), who combines with Jerry Beller to lay down a fantastically beefy bottom end for the marauding keys and fantastically fluid and perfectly syncopated guitar work of Steve Mauch and Baker himself respectively. Some more astute readers of this site may have noticed that many of our reviews go in for a ‘track by track’ approach. Well, I’ve listened to this thing about thirty times now, and all I’ll say is this – listen to the 12 minute opener Walk On Alone on any legal streaming site, or better still 10T Records ~ Mars Hollow page. Once heard, it’s ‘add to cart’ time. This is one of the very best American symphonic progressive rock albums I’ve heard, and the last time I said that (for my naïve debut review) I gave a 10. Now, I know how much my DPRP colleagues gnash their gums and get, frankly, violent whenever a 10 is given out so I shall, as I always have, be guided by my DPRP reviewing guide: Brilliant, one of my top 5 of the year. This review first appeared on the DPRP website in 2012, and is reproduced ahead of recently announced new music by Jason. Jason, as you might expect, plays all the keyboards but he also takes on lead vocal duties. He plays a ton of other stuff too: percussion, glockenspiel, trumpet, guitar and sound effects. Suffice to say, then, he’s an extremely talented lad. His vocals are a revelation, perfectly suited to the pastoral, symphonic prog on offer and his keyboard playing, apart from being fantastic, is highly reminiscent of Tony Banks. As if this wasn’t enough, he’s brought in a few friends from Izz as guest players. John Galgano plays bass, Paul Bremner plays guitar and Laura Meade adds backing vocals. Most of the guitar work is handled by Jack Petruzzelli (Patti Smith) and Matt Johnson (Jeff Buckley, Rufus Wainwright) plays drums. The third track, face behind the eyes features Keren Ann and a certain Mr Hogarth appears on the bonus track, a cover of Rufus Wainwright’s Go Or Go Ahead. Musically this is a melodic, symphonic prog fan’s dream, with four epic pieces in addition to the cover tune. Think Genesis circa Wind And Wuthering or A Trick Of The Tail and you won’t go far wrong. There’s a strong Izz influence too, as you might imagine and all in all this is up there with the best of the year for me. In addition to the Izz-inspired elements here we’ve got a tranquil, soaring beauty to the music, very pastoral, very symphonic, very English. It’s beautifully produced too (by Jason Hart) achieving sonic peaks through a gradual build up, and layering, of instrumentation and not just by turning up the volume to 11. 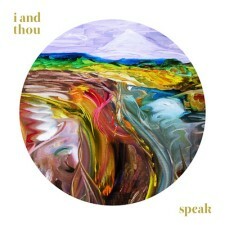 Title track speak kicks things off, and is typical of what is to come, with haunting piano over which Hart’s fragile vocals are laid. Keyboard and guitar become gently intertwined before percussive elements build and typically Banksian keyboard sounds give a distinctive, One For The Vine vibe to the tune before a harder-edged swirling synth pattern takes over. The layering of instrumentation begins from this point, propelling the melodic elements ever forward to the inevitable, perfectly paced climax and denouement. I’d go so far to say that this is better than anything Genesis have done since And Then There Were Three. Paul Bremner lays down some guitar solos in Hide And Seek and (personal favourite) The Face Behind The Eyes that are, in my humble opinion, as good as anything he’s done with Izz. All four long pieces dovetail perfectly, hewn from the same cloth but each adding different rhythmic elements, melodies and textures. Overall they give the impression of comprising four sections of one longer suite before the Rufus Wainwright cover go or go ahead featuring Steve Hogarth on vocals. H is on top form, and the song, which I wasn’t familiar with, is quite simply, beautiful. Now I’ve seen the album described elsewhere as ‘beautiful’ and you know what? They were right. Not only that, but the cover art, by Annie Haslam is perfectly suited to the material and overall it’s a lovely package. No lyrics, however, but that’s a minor irritation when the quality of the disc contained within is so strong. Fans of Genesis, Izz or Hogarth are going to be in seventh heaven. And for me? Well, yet another American prog CD has made it into my top ten (it’s too good a year to just have a top 5). It truly is a great time to be a fan of progressive rock music, don’t you think?